The one thing that always draws me in to buy a piece of clothing is colour. It is the first thing I'm attracted to, the first thing that pops out at me from the racks of clothing and a starting point for any outfit. As an artist, I have a good eye for colour and it is what drives my entire wardrobe. Although I do have some black pieces, I have very little white and the rest is colour. Wearing the right colour can brighten your mood and make other people react to you differently. Someone void of colour can be perceived as sombre, elegant, moody, edgy or sophisticated. 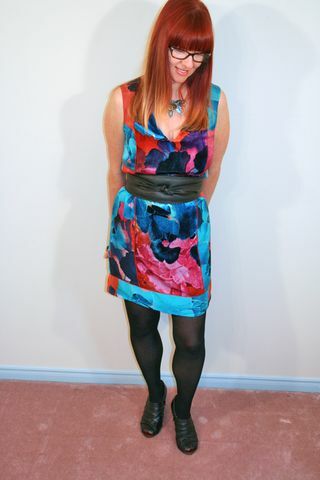 Someone wearing lots of colour can be perceived as energetic, healthy, creative, effervescent, gregarious or wild. Understanding which colours look best on you is probably the first thing to learn when trying to dress yourself well as it narrows the parameters of your search. I knew this dress would work on me before I ever tried it on. The sad thing is of course I was right and then wanted to buy it. I was smart enough to wait it out till it went on sale at close to 75% off. One thing is true, I waste very little time in the fitting rooms because I know in advance what will work and what won't. Although the blue sweater coat here is lovely I ended up taking it back. I couldn't justify keeping it when I had difficulty pairing it with more of my existing wardrobe. I think a good rule of thumb is that you should be able to make at least 3-5 other outfits with the piece. Otherwise it needs to go back. How do you like my computer glasses? I kind of wished I didn't have lenses in them because I'd like to wear them more. Too bad my eye Dr. did not agree. 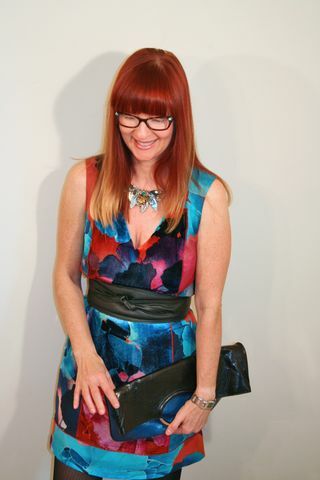 The print of your dress is great and I love it with the black accessories!